Worldwide, advertisers will spend $600 billion this year. The money in most of those budgets will fund projects, programs, and initiatives that focus on trying to get people to call, click, or visit. Many studies claim that 90% or more of those marketing dollars are spent on outbound marketing using broadcast, print, digital, outdoor, and other channels. But a very small amount is spent on inbound marketing - marketing focused on those prospects and customers who contact or visit you. So what happens to the interested prospects and repeat customers who actually take the time to seek you out? They can reach out to you in one of three ways. They can call you on the telephone. They can look you up on your website. And they can walk through your front door. What will their experience be when they do? Will they be greeted by friendly, helpful telephone personnel, or will they get lost in a cumbersome and time-wasting automated telephone system? Will they enjoy a well-designed website with quality content that's easy to navigate, or will they be relegated to an online wasteland of limited information and confusing directions? Will they feel warm and welcome in a professional, sophisticated environment, or will they stumble into an uncomfortably sterile and uninteresting atmosphere? As a marketer, you invest a lot of time, energy, and money building your brand, creating awareness of your products and services, and getting prospects to seek you out. Why waste those efforts and money by building up prospect expectations with your outbound marketing that your inbound marketing doesn't support? A sound and comprehensive marketing plan must include both outbound and inbound strategies. It would be quite hard to build your business without prospects. It would be just as hard to build your business without being able to turn prospects into customers, or existing customers into repeat customers. Trying to make the best possible impression on, and the best possible experience for, those who take the time to call you on the telephone, look you up on your website, or walk through your front doors is what we call Point-of-Entry Marketing (POEM). Not only is Point-of-Entry Marketing essential to an effective and successful marketing plan, but I believe impressions made by Point-of-Entry Marketing are more valuable than those made through outbound marketing for the following reasons. 1) Always reach your most important target audience. Your existing customers and interested prospects. Broadcast, print, outdoor, or any other traditional advertising can't guarantee every impression it makes will be on a viable prospect or customer. But Point-of-Entry Marketing can. While traditional advertising may only reach your targeted audience one out of a thousand times (or less), POEM will make impressions only on interested prospects and customers 100% of the time. 2) Always reach your prospects and customers when they're in the right frame of mind to do business with you. When it comes to marketing - or any other type of communication - there's something to be said for timing. Your audience is either ready to listen to and act upon your message, or they're not. POEM influences prospects and customers who have taken the time to seek you out. And it's especially important to reach buyers during business or shopping hours when they have their hands on their wallets and they're ready to buy. 3) Make invaluable marketing impressions on every person who enters your company - EVERY SINGLE ONE. There's no other method of marketing that can make that claim. Digital marketing can't. Direct marketing can't. And print, broadcast, and outdoor advertising can't. Only Point-of-Entry Marketing makes an impression on every single person who enters your company, whether they call you on the phone, visit your website, or walk through your front door. 4) Pick up where your traditional outbound marketing leaves off by providing a consistent transition "into" your organization. How many times have you been impressed by a company's marketing and advertising only to be completely let down when you actually followed through and contacted the organization? Maybe it was a poorly designed website, a cluttered lobby, or a frustrating telephone system. POEM can keep you from wasting the interest your outbound marketing generates. 5) Reinforce your brand identity. Can you think of a better opportunity to reinforce your brand identity than during the thousands of hours a year your customers are spending on hold, perusing your website, or shopping in your store? 6) Expand top-of-mind awareness of your products and services. How many of your customers aren't aware of everything you do? I'd bet it's the majority of them. People are bombarded with information on a non-stop basis every day. As a marketer, you know that to get your message to stick, you have to repeat it over and over. Each time a customer is on your website, or visits your store, or calls you on the phone is an opportunity to reinforce awareness of what you sell. 7) Improve your call-to-action or direct response marketing. I once called a car dealer for a price on tires. They were too expensive and I ended up getting them elsewhere. But during the call, I was put on hold and heard about a winterization special that sounded like a great deal. I had the work done and was so pleased with the service that I ended up buying my next car from them. Don't underestimate the power of using the time your customers spend on hold, stand in your lobby, or read through your website to ask them to take action. 8) Increase impulse purchases. 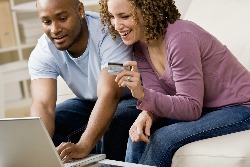 There are some pretty reliable sources that claim up to 90% of all sales are made on impulse at the point-of-purchase. I can't tell you the last time I went into a grocery store to buy a gallon of milk and came out with just a gallon of milk. 9) Increase your customer share and retention. Have you ever heard a customer say "I didn't know you did that"? Hopefully, it wasn't right after they switched to a competitor for a broader selection of products or services. The more you provide a customer, the more valuable your relationship is perceived to be and the less susceptible your customer is to competitors. And Point-of-Entry Marketing is one of the best ways to let your customers know about all you do. 10) Spend less money. With POEM, the medium is FREE. The cost to produce a radio or TV commercial, a magazine or pay-per-click ad, or an online video can be expensive. But it's nowhere near the cost of actually running the ad. Media can be ridiculously expensive. With POEM, you still pay to create the content, but the media is free. Whether you're telecasting messages to your callers, store casting specials to your shoppers, or using your website to provide information to online visitors, you own the media. So, if you're not doing it already, focus on providing the best possible impression on, and the best possible experience for, people who take the time to call you on the phone, look you up on your website, or walk through your front doors.